Sulle nuove fotocamere digitali il preview non funziona, pertanto bisogna acquistare il raccordo 6Bit che realizziamo (art. 4299). Realizziamo su richiesta altri terminali tipo Contax / Yashica, Pentax, Olympus, Nikon, vite M42 chiedere. 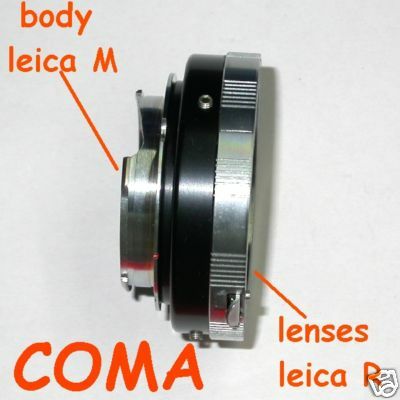 Adapter in order to mount on the telemeter cameras type: Leica M Woitglander bajonet etc etc having thread screw bajonet M , the optical with graft to screw Leica R. We realize if asked other terminals type Contax\ Yashica, pentax, Olympus, live 42x 1. Ask. ATTENTION: on the new digital camera preview does not work, so you have to buy the fitting 6Bit we make (art. 4299).